Are the documents in plain language? Can you correct your earlier documents? How will we alert you to possible updates to your documents? What file formats does Cleardocs send you the documents in? What are the benefits of plain language? Who do you contact about legal questions? What is so different about Cleardocs? My system freezes when I try to save on Cleardocs: what can I do? My former professional adviser ordered documents through Cleardocs on my behalf but I am no longer in contact with them: what can I do to get access to the documents? All Cleardocs documents are in plain language. Cleardocs is absolutely committed to the hallmarks of its brand: clarity | simplicity | ease of use. The founder of Cleardocs, Christopher Balmford, is an internationally recognised plain language expert. His clients include 8 major national law firms, 10 public listed companies, 5 government bodies, the ASX, the United Nations and the European Central Bank. He is a lawyer by training and practised as a solicitor from 1988-1999. Christopher is a regular speaker at international plain language events and in 2001 helped deliver a one week intensive legal drafting course in the Law Faculty at the Univeristy of Cape Town (with Professor Halton Cheadle from Cape Town and Phil Knight, a plain language consultant in Canada). David Kelly is involved in writing the Cleardocs documents. David is the former Chairman of the Law Reform Commission of Victoria. He was the main author of the Commission's ground-breaking reports on Plain English and the Law. From 1993-2000, David was in charge of Phillips Fox's clear communication strategy and its precedent creation and management. Phillips Fox is an international law firm with offices throughout Australia, New Zealand and Viet Nam. Previously, David was a Professor of Law at the University of Adelaide and Secretary to the Victorian Attorney General's Department. David has published several books on insurance law. Each master document used on the site has been approved and signed-off by 200-lawyer Melbourne and Sydney law firm Maddocks. This firm is responsible for maintaining the documents and keeping them fully up-to-date with the law. You can be assured that the Cleardocs interface, and the documents we produce, are comprehensively and consistently maintained. In support, Maddocks provides a free legal helpline in relation to Cleardocs documents. If you have a legal query, then first ring the Cleardocs helpline and we will arrange for you to speak with the relevant person at Maddocks. The firm provides a free legal helpline in relation to the documents Cleardocs provides. If you require other legal advice in relation to your particular circumstances, then this will be charged for. Our phone number is 1300 307 343. You can correct your answers for documents you created on an earlier visit for free. You can do this as often as you need but only until the documents are correct for the particular circumstance you require. Then, you should leave them alone, as they are stored on the Cleardocs website as a permanent legal record of the matter. We have various protocols to prevent theft and fraud. In some cases, the system may ‘freeze’ a document and prevent any further edits. You can 'unfreeze' the document by ringing Cleardocs on 1300 307 343. You pay for the documents either by regular invoice (if you are a professional firm creating documents regularly) or by credit card. Let us know which your prefer. You can change at any time. If you pay by credit card, the Westpac PayWay Secure Internet Payment Service handles the payment. Your records are not seen, or stored on our site. All the payment pages are on the Bank's site. We send you a Tax Invoice, which means that if you are a professional customer creating documents on behalf of a client, then you can simply bill the cost as a disbursement. When we update a document on our site, we will enable you to easily update the documents you've created in the past. set out a simple and cheap way for you to make the update. Cleardocs helps you enhance your relationship with your clients with the greatest of ease and at minimal cost. With all the Cleardocs products, you simply answer some straightforward questions and the intuitive technology shapes and creates the tailor-made documents for your clients. The whole process generally takes only a few minutes, and you can download the completed, legally signed-off documents immediately. Cleardocs plans to add other documents to the site. You can suggest documents you'd like by emailing Cleardocs at support@cleardocs.com. We send you the documents in a print-ready Portable Document Format file, otherwise known as a 'pdf' file. To open and print the document, you'll need Adobe Acrobat, or an equivalent PDF reader. Plain language is widely accepted throughout the English speaking world — even in the law. Since the work of the Law Reform Commission of Victoria in the late 1980's and early 1990's, the legal profession throughout Australia has endorsed plain language. This endorsement is made by firms, by government and by the legal profession's associations. plain language documents make administration easier. they sweeten relationships rather than sour them. they enable people to make informed decisions comfortably and confidently. Many of our professional customers tell us that their clients comment that our documents are refreshingly clear. In Australia major law firms are increasingly committed to plain language. Some of them even market plain language services and use their commitment to plain language to distinguish themselves from their competitors. In the USA the Securities Exchange Commission requires certain parts of prospectuses to be in plain language. In the United Kingdom the government has recently enacted legislation replacing many old 'legalese' words with plain language replacements. If you have any legal questions in relation to the Cleardocs documents, then you can use the free legal helpline that the law firm Maddocks provides to Cleardocs users. Maddocks are our lawyers. They sign-off the Cleardocs master documents and the question interface before we put the documents on our site. The first thing to do is ring the Cleardocs helpline. We will arrange for you to speak with the relevant lawyer at Maddocks. If you require other legal advice in relation to your particular circumstances, then this will be charged for. Our number is 1300 307 343. If ASIC rejects your application to register a company, then it's easy enough to fix things and it is free — there is no charge from Cleardocs and no charge from ASIC. Below, we have set out some common reasons — and the related solutions — about why ASIC might reject your application to register a company. Click the "Review answers" button — it is light blue, and in the left-hand box under the heading "What next?" On the next page, click the red button "Go to questions"
At the bottom of the page, click the red button "Save and continue"
At the bottom of the next page, click the red button "Lodge with ASIC". that is a PO Box. To make the changes to the address, follow steps 1 to 7 (see above under the heading "How to change your answers and re-lodge the application to register a company with ASIC"). By the way, in the Northern Territory, you can use 'NT Por' addresses. But you'll probably need to email evidence of the address to us so we can email it to ASIC. already taken — or is similar to a name already taken. When you work out the new name you want to apply for, follow steps 1 to 7 (see above under the heading "How to change your answers and re-lodge the application to register a company with ASIC"). You can try as many names as you need to until the company is registered — it's free, there are no more charges from Cleardocs or from ASIC. You can review your answers by following steps 1 to 4 (see above under the heading "How to change your answers and re-lodge the application to register a company with ASIC"). you will probably find an incomplete answer, or something that doesn't make sense; then. follow steps 4 to 7 (in the list above) to make the changes and re-lodge with ASIC. the only website online where you, by yourself, at any time, can register a company electronically with ASIC and get the Constitution. You can get a company registered in less than 20 minutes and download all the legal documents (constitution, minutes etc) instantly to your desktop. the only place where you can update existing (or create new) your SMSF deeds electronically, and manage the ongoing maintenance of those deeds online - no more expensive legal reviews required. the only online legal document service backed by a top 20 law firm (Maddocks). the only legal document service that is a proud supporter of the Chartered Accountants Australia and New Zealand. the only legal document service that allows you to change your answers to your documents online, even after you have paid for them, until they are signed and executed as legal documents. No more costly issues with 'changing your mind' or typos. significantly better value than other providers: Trusts (& SMSF's) $148.50, Companies $625.50, SMSF Updates $121.00 and a range of other great quality products. You can read more about the Cleardocs advantages here. have some "add ons" which block the attempt to save due to the large size of the Cleardocs pages. The above combination is the most common one we hear about that causes problems. But other combinations sometimes cause problems too. The solution below is likely to work for most combinations that cause problems. There are two solutions to choose from. click the Windows "Start button"
in the search space, search for "Mozilla Firefox". If Mozilla Firefox is not on your system, then you can download it for free here. When you have Mozilla Firefox open, you can go to Cleardocs and proceed as normal — except that saving your answers should work. 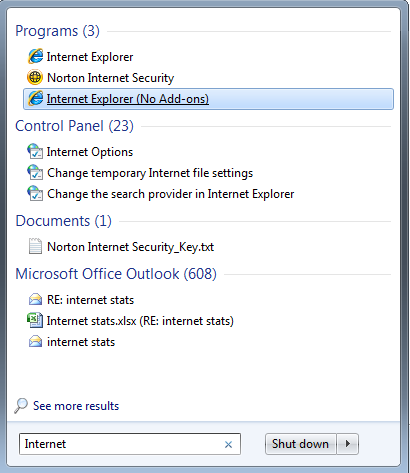 You can use Internet Explorer "without add ons". in the search space, search for "Internet"
then go to Cleardocs and proceed as normal — except that saving your answers should work. the third party (or their employer) provides authorisation for you (or your new advisor) to receive the documents. Cleardocs has obligations to the third party because we entered into a contract with them when they bought documents relating to you. So, we can't release information exchanged under that contract without their consent. In circumstances where a self-employed third party is deceased, the consent of the client and the third party's legal personal representative would be required to obtain access to the documents. The Institute of Chartered Accountants Australia's Members Handbook Guidance Note 'N1 — Books and Papers' provides guidance as to how to establish which documents and records are owned by members (accountants) and which are owned by their clients. According to Guidance Note N1, ownership may be determined by reference to the contract between the member and the client, the capacity in which the member acts in relation to his clients, and the purpose for which the documents and records exist or are brought into being. If you have difficulty obtaining consent from your adviser, Maddocks recommends that you contact the adviser's professional body.